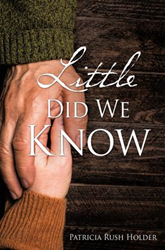 Patricia Rush Holder’s new book, Little Did We Know ($13.99, paperback, 9781498496179; $6.99, eBook, 9781498496186) is a story of a lifetime of reality and yet expectancy as the author experienced day learning to live with the fact that her husband was losing his eyesight to an incurable disease. The book shows how they dealt with their everyday living, raising a family, and continuing the work pattern to provide for this family. This was all accomplished by trusting in the Lord God to help them maintain balance, love, and joy and yet deal with the reality of the loss. God has given freely to Patricia, therefore, freely she has received, and wants to share her inspiring story with readers. Patricia Rush Holder brings the Holy Bible and its writings, the scriptures, to life. She stands in authority as a true believer of the Lord Jesus Christ, knowing He has called her into His kingdom to be His servant and teacher of what He has taught her in living life for 50 years. Patricia is blessed, redeemed, sanctified, and set free by the Blood of Jesus Christ my Lord. Xulon Press, a division of Salem Media Group, is the world’s largest Christian self-publisher, with more than 12,000 titles published to date. Retailers may order Little Did We Know through Ingram Book Company and/or Spring Arbor Book Distributors. The book is available online through xulonpress.com/bookstore, amazon.com, and barnesandnoble.com.